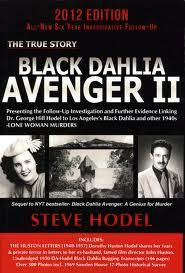 I have just finished reading Steve Hodel’s Black Dahlia Avenger II. For those of you unfamiliar with Hodel’s research and writing on the Black Dahlia case, let me give you a little background. Steve Hodel is a retired LAPD Homicide Detective. Hodel’s father, Dr George Hill Hodel, died in 1999 at the age of 91, and Steve Hodel subsequently found two photographs amongst his father’s possession which he believed at the time to be of Elizabeth Short, aka the Black Dahlia, the victim of the most brutal and notorious unsolved murder in Los Angeles history. Hodel started an investigation which examined the potential connections between his father and Elizabeth Short. Ultimately, he came to the conclusion that his father murdered Elizabeth Short after being inspired by the Surrealist art work of Man Ray. Hodel puts his thesis forward convincingly, and thrillingly, in the original Black Dahlia Avenger (2003). I first came across the Black Dahlia case after reading James Ellroy’s celebrated novel The Black Dahlia (1987). I would heartily recommend Hodel’s book as compelling in its vivid portrayal of LA and the LAPD in the 1940s and 50s. Hodel maps out connections between the Surrealist art movement, Hollywood, organised crime and the LAPD. His research has become influential, inspiring more books on the topic, such as the excellent Exquisite Corpse: Surrealism and the Black Dahlia Murder by Mark Nelson and Sarah Hudson Bayliss. In Black Dahlia Avenger II, Hodel presents a follow-up to his original investigation. It is not as groundbreaking as the original, but it is full of interesting research and a must-have for anyone who is fascinated by the Black Dahlia case. Glad you enjoyed BDA II, the new follow-up book. Thanks for the write-up. Also, just put it out in digital format, which is as you know, great for searching for details. I was slow in coming to digital, but have to admit, beats the hell out of the old index search. Still working on trying to get LAPD (and others) to do some DNA testing, but so far can’t get them off their Sam Brownes. No problem Steve. Good luck with the campaign.